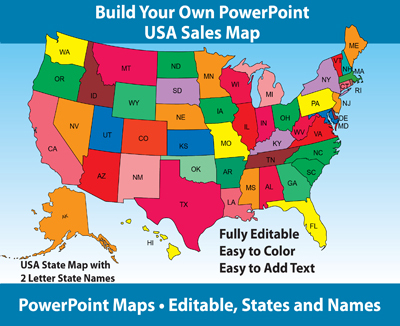 This video shows you a simple technique to divide one of our downloadable, editable MapsForDesign.com PowerPoint State, County or Country Clip Art Maps in half giving you two territories that you can color differently. Our second option is to use one of the Line tools located in the LINES Pop-Up box in the DRAWING TOOL BAR (I like the Freeform tool that uses straight lines the best) and trace the smaller half of the state over the outline of the map below. This method works best for some of the simpler state outlines like Colorado or Wyoming. Once you have it drawn the new territory you can give it a color and to the viewer it looks like you have split the state or county in half but in reality you have just drawn a new half of the state map on top. Remember to bring the line back to the beginning point and match the line weight and you will have an object that can be filled with a new color. TIPS: Use the Zoom pop-up box in the Standard Toolbar to get in closer. 300% or 400% works well. If you need to you can adjust the points by selecting the new object with your pointer and choosing EDIT POINTS from the DRAW pop-up menu on the far left of the Drawing Toolbar or by clicking with the right-click and selecting Edit Point. Also make sure SNAP TO GRID in the DRAWING menu is not checked. This method isn’t perfect but will work pretty well and allows you to set up the partial territories pretty quickly.